Cross-posted at A Safe World for Women. 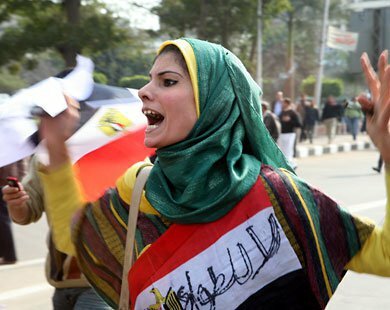 As I’m sure you all know, Egypt has erupted in civil unrest a civil uprising. The largest anti-government protest in Egypt in 30 years, civilians are protesting President Mubarak’s regime, calling for his resignation. People have poured into the streets demonstrating, incited by skyrocketing inflation and severe lack of jobs. The world is watching, waiting to see how events unfold. I’ve been scouring the live updates on Mother Jones’ website (a phenomenal source of information to get you up to speed on the protests) and glued to the live stream of Al Jazeera English, the Arabic language news network. While I’ve been watching for the past few days, almost all of the images have been of men in protest. I’ve been wondering, where are the women? So if 20-50% of women are protesting, why aren’t we seeing that reflected in the images shown on the news websites and networks? Where the hell are those images?? 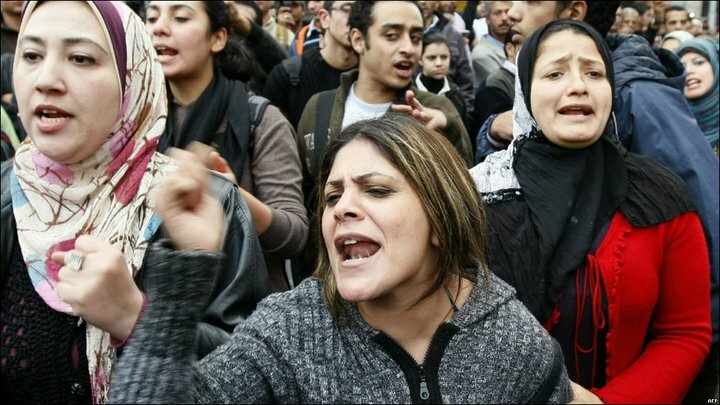 On Facebook, Leil-Zahra Mortada has been compiling photos in an album called the “Women of Egypt,” chronicling women protesting in Egypt. Night after night, women and men have defied the government imposed curfew in Cairo, gathering in Tahrir Square, aka Liberation Square. A “Million Person March” towards the presidential palace is planned for tomorrow and a nationwide strike planned for Wednesday. 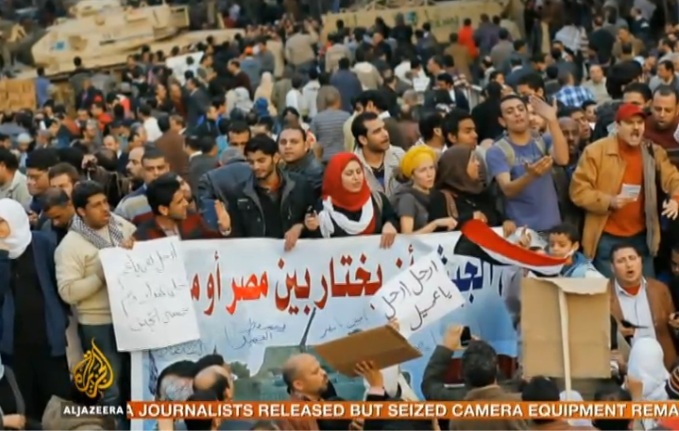 Egyptian civilians say they won’t stop protesting until President Mubarak steps down from office. 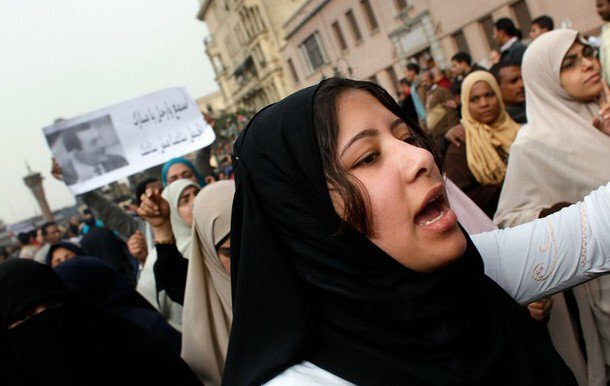 And women in Egypt will be advocating for justice too. But when the media doesn’t show images of women involved, it appears as if they aren’t entrenched in rallying revolutions; they are written out of history. Women don’t merely sit on the sidelines, having their husbands, brothers, fathers and sons wage battle for them. 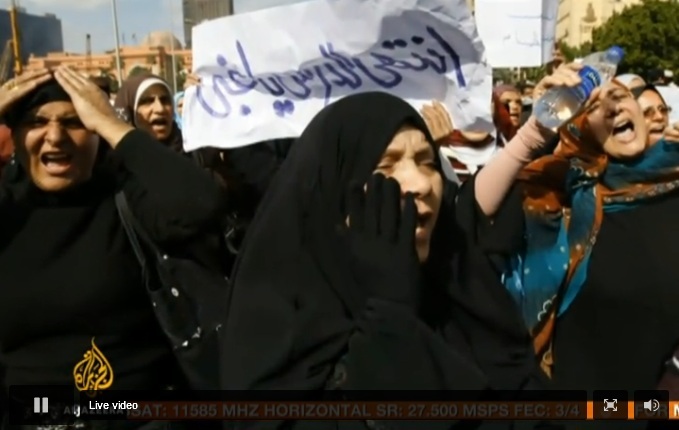 Women confront corruption, fighting for freedom for their country and themselves. Previous post ← When the Moon Hits Your Eye Like a Big Pizza Pie: Happy Vegan Pizza Day! I could not agree more with you, I even sent a letter to the NYT why its pictures and article coverage did not reflect this fact. And of course no response. Perhaps we should do something. Thanks for the great article. We need so many feminist watchdog groups to keep the lamestream malestream media honest. I have been watching the images on TV and wondering where the women are in all this – and well done to Manisha for contacting the NYT on this issue. I have linked to your blog on my site, as has Global Voices.. It’s good to pull all these images and blog posts together. I think, that these women experienced in their lives much grief and sorrow. They need support. It’s very sad that the government doesn’t reflect the real situation. Thank you, Everyone, for your comments! @Manisha, I’m SO glad you wrote to the NY Times…good for you! @Julie, thank you, that was so kind of you to post a link to my blog. While more posts and news articles have been published regarding women protesting in the revolutions, they are still not nearly as visible. I recently wrote a magazine article about the protests in North Africa. Just as they were missing from many accounts in Tunisia and Egypt, despite women protesting in Libya, sadly they are absent from those narratives as well. I’m so tired of the media attempting to write women out of history.